There are a number wonderful islands found with in the Great Barrier Reef. And the Whitsunday Islands are the most popular holiday destinations out of them all. Flights arrive at Proserpine Airport (south west of Airlie Beach as shown on the Whitsundays Map) where you can either fly direct to Hamilton Island or transfer over to Airlie Beach. After a short trip from Airlie Beach to Shute Harbour all the Whitsunday Islands can be accessed by boat. 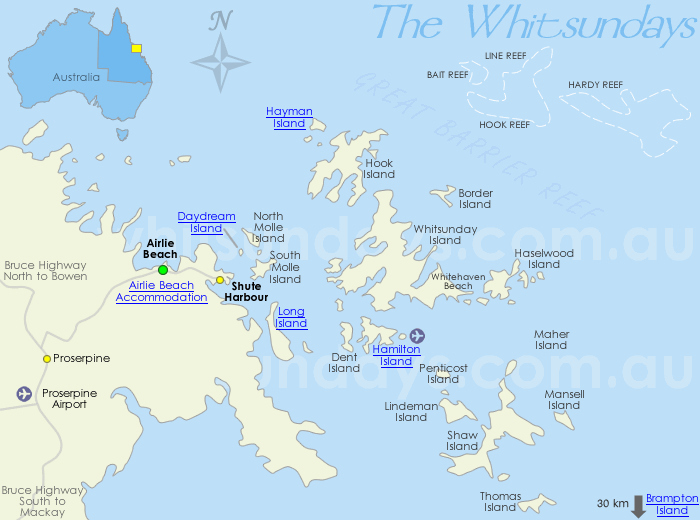 *The below Whitsundays Map is not to scale.